There are three theories related and being use in this article. The first theory is the traditional view of reading (Dole et al, 1991). According to this theory, novice reader's needs to acquire a set of hierarchically ordered sub-skills that consecutively build toward comprehension ability. Contained in this theory, the students have the ability to comprehend the texts by making sense of the words within the context of the sentence. According to Nunan (1991), being able to read using this view is being able to interpret a series of written symbols to the auditory equivalents as a way for the readers to make sense of the text they are reading and to reproduce the meaning of the reading itself. In other words, this process is called the "bottom-up". The bottom-up reading is done step by step as mentioned by Nor and Samad (2006). The technique begins with the eyes identifying visual information in the materials and this technique begins with the identification of the letter and the sounds follows subsequently. Next, the identification of the lexical items is done through grapheme-phoneme correspondence and being put in the short term memory (STM). This is where the phrases, clauses and sentences are being constructed. This model requires an accurate comprehension, sequential identification of letters, words, phrases, clauses, sentences and the pronunciation. The other meaning of this view is that it is also a process of "outside-in" as mentioned by McCarthy (1999). 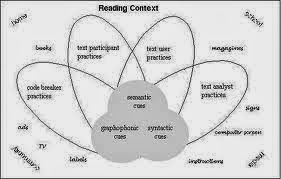 To make it simple, the bottom-up model recommends that reading should begins from the low-level processing. The printed texts that being read by the reader can only be interpreted and understood by the reader himself. Apart from the definition given below, this traditional view of reading always been under attack because of the insufficiency and lacking one or more of the usual forms of grammatical inflection mainly the words and structure. The second theory is the three major types of schemata. The types of schema mentioned by Carrell (1984) are the linguistic schemata, formal schemata and content schemata which are related to the reading comprehension. The linguistic schemata refer to the existing knowledge that the readers have in vocabulary and grammar. It is the foundation for other schemata as it is essential in helping the readers to grasp and decode the text they read. If the readers do not have this schema, it will be hard for them to understand and to decode texts they read. The more linguistic schema the readers have, the easier for them to understand and decode what they are reading. The second schema is the formal schema. This schema has been explained to be abstract, encoded, internalized, and having coherent patterns of meta-linguistic, discourse and textual organization that are being used to understand a text. The reader tries to use any information that they have in order to understand and to comprehend the English text they are reading at that particular of time. But the formal schema offers less power in the reading process as mentioned by Carrell (1984). In this study, the formal schema helps the students to make relations between the background knowledge that they have with the new one that they just bumped into under the same topic. This is to help them in comprehending the reading English texts in the possible way as they can. The third schema in the schemata theory is called content schema. In other terms, this schema explains about the reader having the information or background knowledge on the topic that is being brought up in the texts they read. A language is not only the combination of vocabulary or grammar but it also involves the culture of the language and this is where the information came. With the content schema, it can complete the lack of language schemata and thus helps the students in comprehending texts and to be able to put aside any ambiguities and irrelevant words or sentences in the texts. The third theory used in this study is the affective filter hypothesis by Stephen Krashen. This theory involves the attitudes towards the target language and its relationship with the input achieved by the students. It shows that how attitude is very important in learning language. If the students have a very high or strong affective filter, they tend to have less input. If the students do understand the input, the input will not reach part of the brain that takes charge of the language acquisition. It is different to students who have low affective filter who will have the tendency to obtain more information and because they have more positive attitudes to the language they are learning, they are more open to the input they obtain.